Step up to the plate and take your turn as you spin the Wheel of Wealth. Click here to play! There is plenty on offer at this exciting Special Edition slot, so don't miss out! 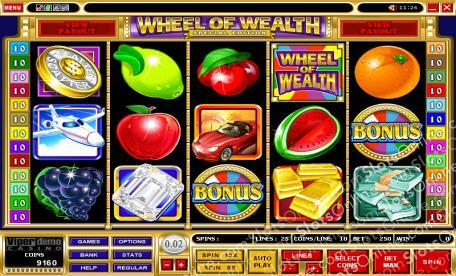 Wheel of Wealth Special Edition is a 5-reel slot played across 25 lines of monetary mayhem. The Wheel of Wealth symbol is Wild and besides paying out up to 10,000 times your initial bet, it also acts as a substitute for any other symbol except Bonus and Scatter. The Scatter can appear anywhere on the reels and will earn you up to 200 times your wager, as well as multiplying wins on specific combinations. If you manage to spin up all 5 Bonus symbols in one turn you will activate the lucrative Wheel of Wealth Bonus Round where get to spin the wheel for massive payouts! Take your turn on the Wheel of Wealth Special Edition today for some fantastic cash prizes. The Scattered symbol can appear anywhere on the reels and pays out when two or more are shown after a spin, up to 200 times your initial stake. The Wheel of Wealth is Wild and will pay up to 10,000:1 on your bet. Also, it can act as a substitute and will double all winnings when doing so. Spinning up 5 Bonus symbols will activate the Wheel of Wealth Bonus Round where you can spin the wheel for huge cash winnings.